The above planned Trip has come together through the continuing and kind support of the Nigerian Railway Corporation, who have very generously made available a suitable train comprising of a diesel engine and three passenger coaches for our exclusive use. The details of the Trip are as below. This Trip is open to non-Legacy members who will be required to pay the appropriate membership fee for 2011, as below. The Trip is child friendly, but please note that due to the size of the train, total numbers expected is around 200. 1. 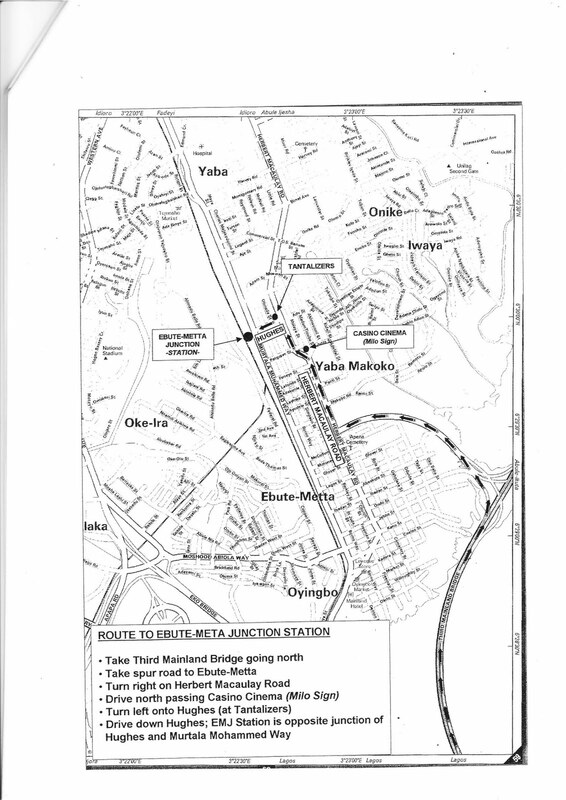 Departure will be from Ebute-Metta Junction (EMJct) Station at 9am ( directions to EMJct below). Return to EMJct is expected around 1.00pm. 2. Destination planned is Ijoko, about 40 km away, where some limited activities are currently being arranged, including an audience with the Oba. 3. Cost for Legacy members will be: Adults @ N3,500 each, Children @ N1,500 each and Students @ N1,000. 4. Legacy membership fees for 2011 are: Individual Adults @ N1,500, Families @ N3,000 and individual Students @N1000. 5. Participants should bring their OWN LUNCH, etc. however we hope to have light refreshments and drinks. There will be a cash bar for beers only. 6. Reasonably secure parking will be available at the forecourt in front of EMJct station off Murtala Muhammed Way, between Ebute-Metta and Yaba Makoko. This promises to be, if the weather is kind and everything falls into place on the day, an interesting and enjoyable Trip. 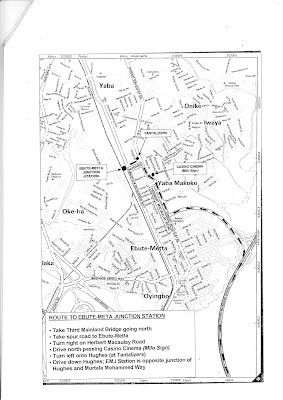 4. take either: next opening on the left at 'Sweet Sensations' (2nd opening on left from 3rd Mainland bridge spur) down Hughes, then cross over Murtala Muhammed Way and into Ebute-Metta Junction Station, or the following opening on the left at Union Bank/white horse sign (3rd opening on left from 3rd Mainland bridge spur) down Commercial Road past the e-Centre/Domino then turn left on to Murtala Muhammed Way. 5. Ebute-Metta Junction Station forecourt is just off Murtala Muhammed Way opposite Hughes. Murtala Muhammed Way is very busy so take care entering or crossing. 6. The Station building is a long two-storey affair with a large green-lettered sign above the entrance with 'Nigerian Railway Corporation' in big letters at the top and 'Ebute Metta Junction' below. Park and go through the main station entrance and the train should be at the platform. I used to make a journey on this line fairly regularly, with my school mates, when I was a school boy! This brings back memories and am probably showing my age here! I love road directions in lagos.